East side of the former building 164 where during the war there was a gas chamber using Zyklon-B for delousing clothing On the extreme right, rather faint, but stilil legible, the number 164. Behind the tree there is a window, once more in its initial position, having been blocked up during the war, where one of the extractor fans was installed. To the left the gas-tight door with another ventilation hole. The electrical control box for the fan has been removed (cf. Photo 13). The gas-tight door, open, taken on a north-west/south-east line (as in Photo 9. but more close up). Interior of the gas-tight door, closed, photographed from inside the former gas chamber on a south-north line. It is likely that the dark patches on the wall to the right of the door are bluish, a characteristic sign of the prolonged use of the room for gaseous delousing using hydrocyanic acid, the main component in Zyklon-B. 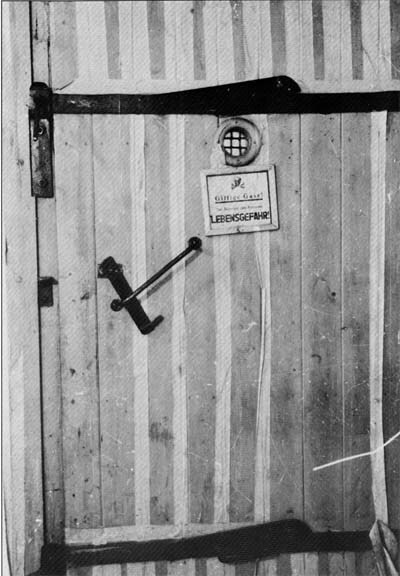 Gas chamber door produced as evidence of the existence of homicidal gas chambers by the LICRA lawyers during the “Faurisson” trial. Exhibit furnished by the archives of the Warsaw Central Commission for the investigation of Hitlerite crimes in Poland. Instruction “Giftige Gase! Bei Betretendes Raumes LEBENSGFFAHRT / Toxic gases! DANGER on entering this room.” This is not convincing proof of homicidal use. Classified as KL Auschwitz-Birkenau “DISINFESTATION gas chamber door,” Oswiecim, 1945, an incorrect designation as it should be DELOUSING. It has not been possible to find where this door was located and we do not know to which delousing installation it belonged. The strips of paper adhering to it are a sure sign that it was a delousing gas chamber door. One of the likely locations would be as an internal door of the Kanada I gas chamber or chambers, if we compare Photos 28 and Photo 14 of the Kanada I gas chamber.